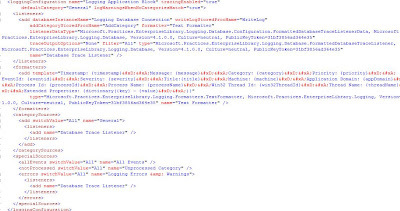 Applications generate logs to keep track of their health, to assist in debugging, and for auditing purposes. Logging makes applications more supportable by giving developers a standardized method for recording application information. The Logging Application Block is designed to support flexible and robust logging configurations. The usefulness of each TraceListener is fairly obvious. You would use the Database TraceListener to log trace messages to a database. The Email TraceListener is for sending trace messages via email. Many companies require audit logging, especially for applications that require history records (or audit trails) of operations performed on sensitive information. This type of logging tends to contain larger amounts of information. In some cases, it may include entire database records. If the auditing is for security purposes, it tends to capture previous and current state as well as who made the change. Logging to a database makes it easy to write queries against the logged messages for troubleshooting purposes. The logging block comes bundled with an out-of-the-box database trace listener that is capable of writing to a data store. To use the database-driven logging, you first need to execute a SQL script (supplied with Enterprise Library) to create the logging database. Run the LoggingDatabase.sql file that you'll find in the C:\EntLib41Src\Blocks\Logging\Src\DatabaseTraceListener\Scripts folder. This will create a database named Logging in your SQL Server along with the required tables and stored procedures. As seen, The logging block configuration schema consists of four key elements named Category Sources, Special Sources, Trace Listeners, and Formatters. By default, the logging application block creates a Formatted EventLog TraceListener entry and configures it as the category source with the Text Formatter as the default formatter. Then generate an exception and you will see a error record in the log table.